In my lab I use to test and play with numerous VMware solutions, I have several nested ESXi servers running. Nested ESXi servers are ESXi servers running as a VM. This is a not supported option, but it does help me to test and play around with software without having to rebuild my physical lab environment all the time. 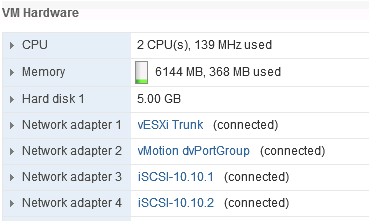 I also have a NIC that connects to my vMotion network, and two nice that connect to my iSCSI networks. I use two subnets and two VLAN’s for my iSCSI connections.